NOTE: This overview map is schematic only. Please use the more detailed Google maps in each stage for accurate directions. Whilst the London Loop (240kms, 150 miles) and the Capital Ring (120kms, 75 miles) are both multi-day adventures, the London Inner Ring can be done (just!) in a day. The idea behind it is to enable you to get ‘under the skin’ of the capital in potentially one long summer’s day walk, which is about 25 miles in total. Or you can break it down into four stages of roughly equal length and dwell more along the way and perhaps take the suggested diversions. The London Loop is sometimes called the ‘walkers’ M25’ because of the route it takes right around the edge of the capital. And one layer in, the Capital Ring takes a circular path not far away from the North & South Circular Routes. The London Inner Ring, by contrast, takes a much more central route, with the City as its pivot and making use of old waterways: the canals (Regent’s Canal, Lee Navigation, Grand Junction), conduits (The New River), rivers (Lea, Thames) and ‘lost’ rivers (Walbrook, Fleet, Tyburn, Westbourne) of the capital. Around two-thirds of the route is close to water (although sometimes you wouldn’t know it, as it’s a few metres below ground!). In fact, one of the inspirations for the walk was a brilliant book called ‘Circle Line, Around London in a Small Boat’ by Steffan Meyric Hughes, which is a circumnavigation of the capital along the Thames, up the Grand Union and then the Regent’s Canal. The specific route I have designed and researched was driven by a determination to walk through as much green space as possible – be it parks, squares, churchyards, waterways, dockyards, terraces or even a sky garden. Thrown in too are the next best things to quiet, green spaces – medieval passages, alleyways and mews. Road walking happens, but it’s a rarity! And even then, I try and pick a quieter, more interesting road. Also, I have taken a keen interest in the astonishing range of architecture, both ancient and modern that you will see along the way. They often say of London that it has the best cuisine in the world because of the variety rather than purely the number of top restaurants, and I think the same could be said of its architecture. This is not a psycho-geographical meander, looking only for grittiness and obscure meanings in randomness, rather it is a celebration of all that is great and majestic about the capital whilst allowing you to experience it in a fresh, new way. The amazing thing is that the whole endeavour would hardly have been possible, certainly not enjoyable except to a die-hard urban rambler, a generation ago. So many parks and open spaces have been dramatically improved in that period; and many parts, most spectacularly King’s Cross and the Olympic Park, have been regenerated lock, stock & barrel. And over that period, the environment has sharply improved too, with the Thames teeming with life again and the smog from coal fires long since gone. One of my favourite recent initiatives is the campaign to make London the world’s first National Park City; in their words “a city where people and nature are better connected. A city that is rich with wildlife and every child benefits from exploring, playing and learning outdoors. 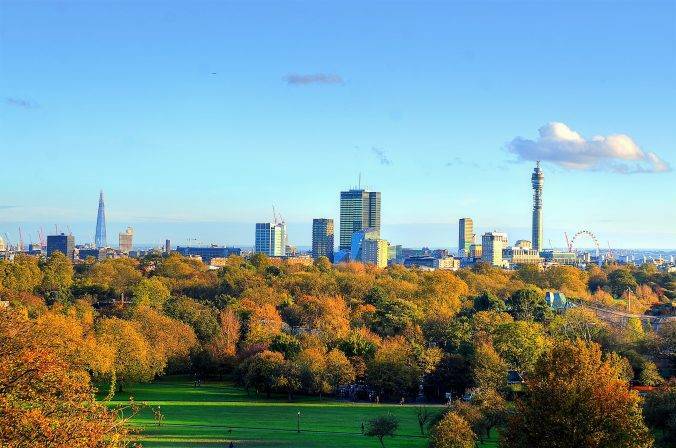 A city where we all enjoy high-quality green spaces, the air is clean to breathe and it’s a pleasure to swim in its rivers.” Incredibly, London has 3,000 parks, 13,000 species of wildlife and 47% of its surface area is green spaces. Mayor Sadiq Khan has recently backed the plan, so it is gaining momentum. Why not sign up to support the campaign too? Maybe one day we will achieve William Morris’s utopian vision of London in ‘News from Nowhere’ (1890), in which his observer wakes, and finds himself in the London of the twenty-first century, in which he imagines: “The soap-works with their smoke-vomiting chimneys were gone; the engineer’s works gone; the leadworks gone; and no sound of riveting and hammering came down the west wind… I opened my eyes to the sunlight again and looked round me, and cried out among the whispering trees and odorous blossoms.” Why not?! So, ultimately this walk is also a celebration of a huge urban regeneration success story that has the power to transform the way we live in cities in the future. This first stage starts and ends with two extraordinary regenerations – at the start the King’s Cross area now called N1, comprising a dozen public spaces, good buildings and a great canal side; and at the end the Olympic Park, a vast green space with great legacy sports facilities; in between, the smart streets of Islington, progressing through the cool Hackney and Hoxton to Fish Island, a story of gentrification and the search for individuality. This stage takes us south down the Lea River, through a part of London that is developing before your eyes, to the Dickensian Limehouse and then the remnants of the London Docks, emerging once again in central London at the iconic Tower Bridge. This stage begins along the medieval passages and alleyways of the city and during the course of the stage passes the ‘lost’ rivers of Walgreen, Fleet, Tyburn and Westbourne. But more than anything this stage is about the seats of power – the City of London, the Church, Parliament and the Monarchy. And the architecture comes at you at least one interesting building a minute. This final stage is a story about the evolution of transport & communication and the way in which regeneration takes place once a particular stage has been superseded. It starts with the horse & cart (Bathurst Mews), the canal (Grand Union), the railway (GWR), the highway (the Westway), ending up with the information superhighway, in the shape of the British Library and Google HQ. Once you have completed this walk, you will have a true topographical insight into what makes London the great capital it is today – massive regeneration, swathes of residential areas, seats of power, majestic open spaces and traces of much of the industrial history that drove the wealth of London. This I would call the ‘sticking to the water’ option. Now I’m not recommending it because you would miss a lot, but if you want to do it in one day you might need to consider the options. If you made all the cuts, the walk would be 8.7 km (5. 4 miles) shorter, so more like 20 miles in total. Now that sounds very doable, especially with a good lunch break, maybe one of the pubs in the riverfront in Limehouse.